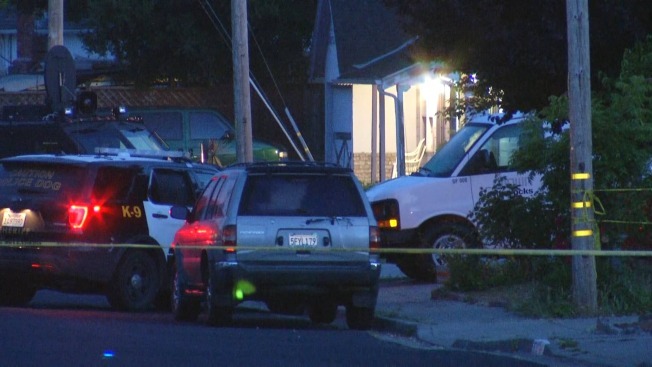 A lengthy standoff involving a man who Contra Costa County sheriff's officials believe barricaded himself inside his El Sobrante home under the influence of drugs has ended with his arrest. Bob Redell reports. A lengthy standoff involving a man who Contra Costa County sheriff's officials believe barricaded himself inside his El Sobrante home under the influence of drugs has ended with his arrest. Sheriff's deputies responded to reports of people yelling and possible gunshots being fired on the 5700 block of Nottingham Drive around 11:15 p.m. Wednesday. The man allegedly fired in the direction of a neighbor's house and a bullet struck an SUV. It remains unknown whether he meant to target the resident of that house or was just shooting indiscriminately. Sheriff's officials surrounded the house with police cruisers and an armored vehicle. They shone lights on the structure and a deputy used a PA to issue commands to the man inside the house, urging him to come out with his arms in the air. The man surrendered peacefully, but not until just before 5 a.m.
Sheriff's deputies have been out to the man's house several times in the last year due to his alleged drug use. Detectives believe he was under the influence of drugs during the hours-long standoff. No one was hurt. A few surveillance cameras were perched on the exterior of the man's house and the words "No Visitors" were printed on the front door. Sheriff's officials said the man suffered from paranoia. Editor's note: Initial reports indicated that a man and a woman were both barricaded inside the house. That information was later updated.